By now, you've seen it. We've all seen it. The photo of #TheDress is plastered everywhere, begging the all important question: What color is it? The debate has torn apart Twitter followers and Facebook friends, celeb couples like Kim and Kanye, and even our own The Fred Group team (we're split 50/50). We've even seen an in-depth analysis of how this relates to the metaphysics of consciousness (an arguably different perspective than we're hearing from Kim K). But one of the most entertaining things to watch, for us, is how professional Twitter accounts hop on Twitter Trends. 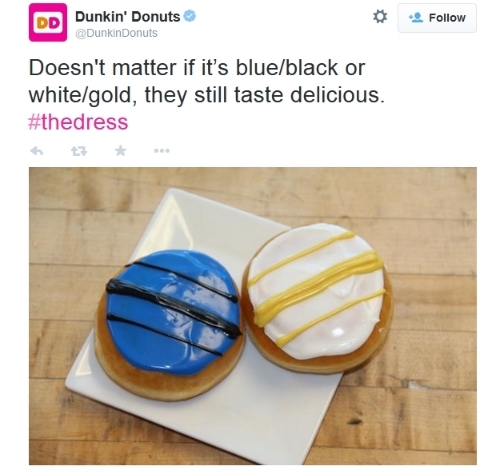 Now that the #TheDress, #blackandblue and #whiteandgold have become top trending topics, here are some of our favorite responses from social media-savvy companies. 1. Because cheesecake. And also...blueberries. Blueberries and cheesecake. 2. Comfort is universal. But we don't think crocs go with that dress, color-coordinated or not. 3. Well played, Yuengling. I'm sure #TheDress debate drove a lot of people to grab a beer. 4. Cuuuuute. 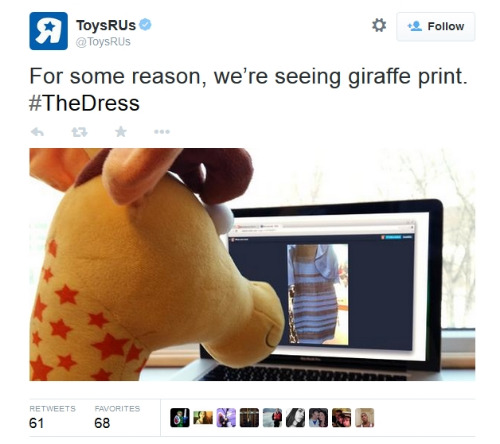 Leave it to Toys R Us to make the dress debate adorable. 5. How awesome would this Penguin Books dress be in real life? We'll take it. 6. Alright, Tide. We see the connection. Nicely done. 8. No matter the colors, we're thinking those cupcakes are delicious. And yes, we're confused, too. Everyone's confused. 9. Again, color is irrelevant here. But we'll take both, just in case. 10. And Taco Bell Canada is just NOT. HAVING. IT. What do you think? What were the best #TheDress responses? What color is it? What does this say about our neurological state and our perception of the world around us? Does North West see black and blue and white and gold?